Help save a beggar from being murdered. Someone's murdering Daggerfall's poor. A beggar named Matthew thinks he's going to be the next one to die. He asked me to find the killer before that happens. Find and investigate the Trade District Alleys. The 'murderer' is a Werewolf! To start this quest talk to Beggar Matthew to the right of the Daggerfall Cathedral entrance. He asks you to help him because his friends have been murdered, and he thinks he'll be next. Agree to help him and he'll tell you to start your investigation in the Trade District Alleys. Go directly east from where Beggar Matthew is located, past the fountain, and check behind the houses. Against the eastern wall near some barrels and crates you'll find a dead Bloodthorn Cultist; examine his body, where you'll discover he was killed by a significant amount of force. From here, head southwest behind the houses across the street, and you'll find Shiftless Gaven to talk to, joined by both Dufrain and Skeevers. He says it is a monster who killed those people, not a person. Now go northwest towards the river, and talk to Panhandler Thomas, who just witnessed the murder of Guillaume to the werewolf. 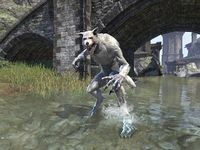 After you talk to him, the werewolf will attack you from the river, and must be killed. 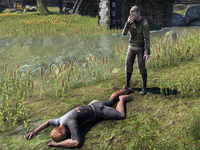 Go to the area in front of the Mages Guild and talk to Lieutenant Dubois for your reward in solving the mystery murders. Matthew suggested I search the alleys of Daggerfall's trade district for clues about the brutal murders of the city's poor. I'll check the South Alley first. After searching the South Alley, I should search the West Alley next. After searching the alleys, I found another murder victim and heard that some kind of monster was seen prowling along the river's edge. I should search there. I found the murderer. It was a werewolf! Matthew said Lieutenant Dubois might offer a reward for dealing with this. I should talk to him. This page was last modified on 6 December 2017, at 20:26.